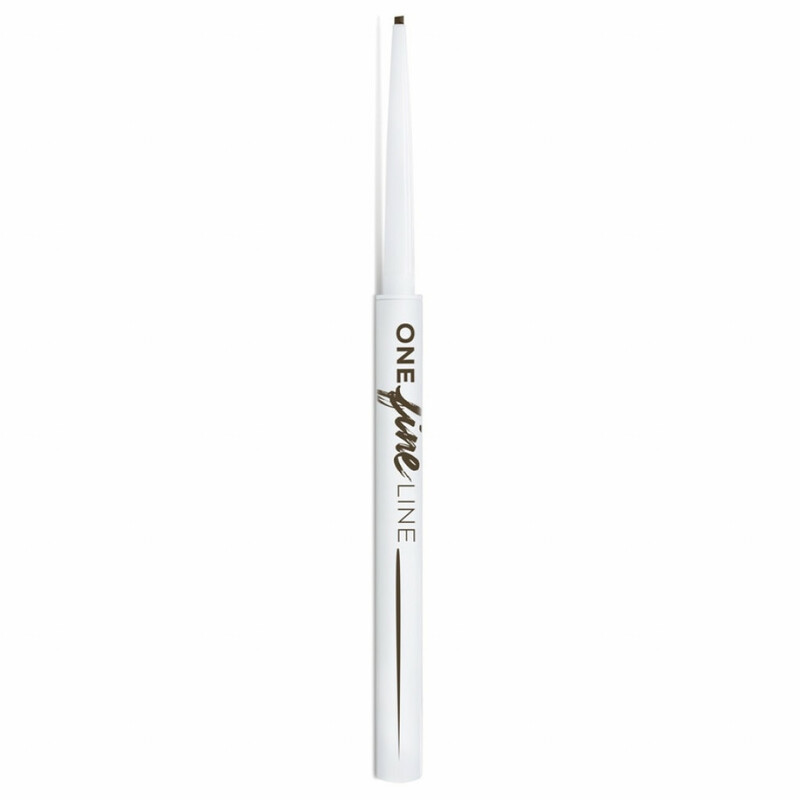 ONE FINE LINE ™ Micro Liner è il nostro eyeliner più sottile di sempre, con una punta ultra-sottile da 1,5 mm per un'applicazione precisa vicino alla rima ciliare e sul bordo interno dell'occhio.La formula con pigmenti minerali dona un colore resistente all'acqua, a prova di sbavature e a lunga tenuta per un finish matte. Le cere di origine naturale contenute nella formula fanno sì che l'applicazione risulti semplice e scorrevole. 0,07 gr - Accurate Espresso Methyl Trimethicone, Trimethylsiloxysilicate, Polyethylene, Microcrystalline Wax (Cera Microcristallina/Cire Microcristalline), Neopentyl Glycol Diethylhexanoate, Copernicia Cerifera (Carnauba) Wax (Cera Carnauba/Cire De Carnauba), Polyglyceryl-2 Triisostearate, Methyl Methacrylate Crosspolymer, Sorbitan Sesquiisostearate, Tocopherol, Synthetic Fluorphlogopite, Aluminum Hydroxide, Dimethicone, Bht. May Contain (+/-): Titanium Dioxide (Ci 77891), Iron Oxides (Ci 77491, Ci 77492, Ci 77499), Ultramarines (Ci 77007). 0,07 gr - Onyx Methyl Trimethicone, Trimethylsiloxysilicate, Polyethylene, Microcrystalline Wax (Cera Microcristallina/Cire Microcristalline), Neopentyl Glycol Diethylhexanoate, Copernicia Cerifera (Carnauba) Wax (Cera Carnauba/Cire De Carnauba), Polyglyceryl-2 Triisostearate, Methyl Methacrylate Crosspolymer, Sorbitan Sesquiisostearate, Tocopherol, Synthetic Fluorphlogopite, Aluminum Hydroxide, Dimethicone, Bht. May Contain (+/-): Titanium Dioxide (Ci 77891), Iron Oxides (Ci 77491, Ci 77492, Ci 77499), Ultramarines (Ci 77007). 0,07 gr - Precise Plum Methyl Trimethicone, Trimethylsiloxysilicate, Polyethylene, Microcrystalline Wax (Cera Microcristallina/Cire Microcristalline), Neopentyl Glycol Diethylhexanoate, Copernicia Cerifera (Carnauba) Wax (Cera Carnauba/Cire De Carnauba), Polyglyceryl-2 Triisostearate, Methyl Methacrylate Crosspolymer, Sorbitan Sesquiisostearate, Tocopherol, Synthetic Fluorphlogopite, Aluminum Hydroxide, Dimethicone, Bht. May Contain (+/-): Titanium Dioxide (Ci 77891), Iron Oxides (Ci 77491, Ci 77492, Ci 77499), Ultramarines (Ci 77007). 0,07 gr - Sharp Charcoal Methyl Trimethicone, Trimethylsiloxysilicate, Polyethylene, Microcrystalline Wax (Cera Microcristallina/Cire Microcristalline), Neopentyl Glycol Diethylhexanoate, Copernicia Cerifera (Carnauba) Wax (Cera Carnauba/Cire De Carnauba), Polyglyceryl-2 Triisostearate, Methyl Methacrylate Crosspolymer, Sorbitan Sesquiisostearate, Tocopherol, Synthetic Fluorphlogopite, Aluminum Hydroxide, Dimethicone, Bht. May Contain (+/-): Titanium Dioxide (Ci 77891), Iron Oxides (Ci 77491, Ci 77492, Ci 77499), Ultramarines (Ci 77007). 0,07 gr - Straight Spice Methyl Trimethicone, Trimethylsiloxysilicate, Polyethylene, Microcrystalline Wax (Cera Microcristallina/Cire Microcristalline), Neopentyl Glycol Diethylhexanoate, Copernicia Cerifera (Carnauba) Wax (Cera Carnauba/Cire De Carnauba), Polyglyceryl-2 Triisostearate, Methyl Methacrylate Crosspolymer, Sorbitan Sesquiisostearate, Tocopherol, Synthetic Fluorphlogopite, Aluminum Hydroxide, Dimethicone, Bht. May Contain (+/-): Titanium Dioxide (Ci 77891), Iron Oxides (Ci 77491, Ci 77492, Ci 77499), Ultramarines (Ci 77007). 0,07 gr - True Navy Methyl Trimethicone, Trimethylsiloxysilicate, Polyethylene, Microcrystalline Wax (Cera Microcristallina/Cire Microcristalline), Neopentyl Glycol Diethylhexanoate, Copernicia Cerifera (Carnauba) Wax (Cera Carnauba/Cire De Carnauba), Polyglyceryl-2 Triisostearate, Methyl Methacrylate Crosspolymer, Sorbitan Sesquiisostearate, Tocopherol, Synthetic Fluorphlogopite, Aluminum Hydroxide, Dimethicone, Bht. May Contain (+/-): Titanium Dioxide (Ci 77891), Iron Oxides (Ci 77491, Ci 77492, Ci 77499), Ultramarines (Ci 77007).